I enjoy a glass of wine throughout the year, but I especially enjoy a glass of sangria around the holidays. 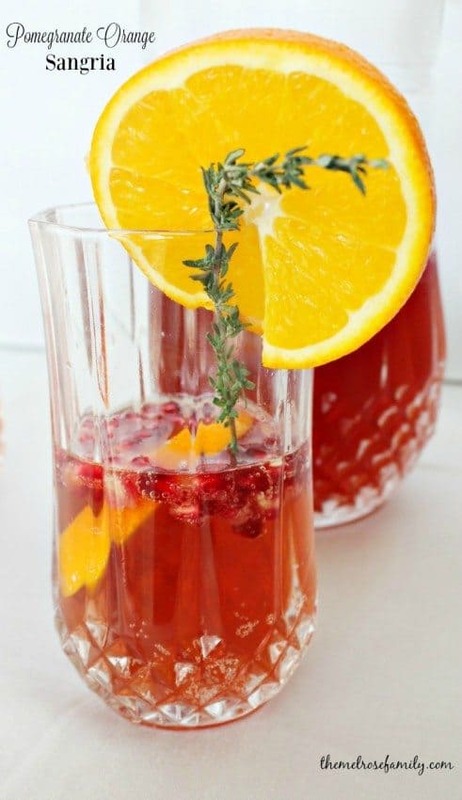 I love incorporating the fabulous colors and flavors of the season into one perfect glass. This Pomegranate Orange Sangria is the perfect combination of fruits with Moscato wine. Not only does this sangria taste amazing, but it is just so pretty. It’s the perfect beverage to serve for the holidays in a pretty crystal glass like my Cristal D’argues Longchamp tumbler glasses and matching pitcher. My glasses and pitcher were a wedding gift almost ten years ago and they are still just as gorgeous as the day I opened them. For the sangria you’ll only need half of the arils from a fresh pomegranate, but be sure to keep the other half to detox after the holiday with our Pomegranate Green Smoothie or Cranberry & Pomegranate Energy Balls. I believe in eating and drinking well to celebrate, but I also believe in getting it all back in check after the holidays. The nice thing is that you don’t have to feel terribly guilty about this season sangria. 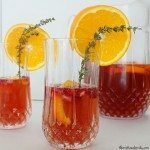 Pomegranate Orange Sangria is a perfectly refreshing beverage. 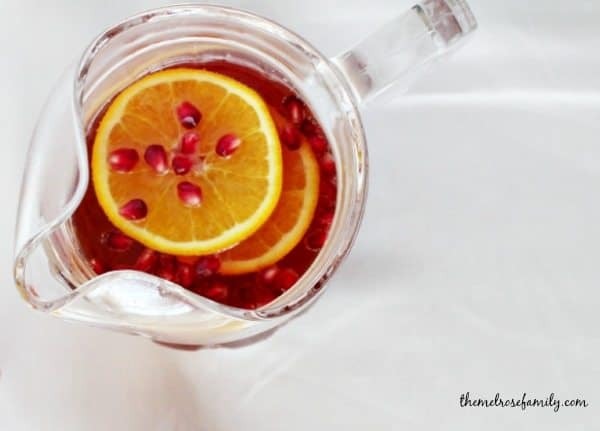 In a large pitcher combine the Moscato wine, pomegranate juice, orange seltzer, pomegranate arils and orange slices. Refrigerate at least two hours before serving. Garnish with sprigs of thyme. Ring in the holidays with a Creative Bloggers Holiday Happy Hour! 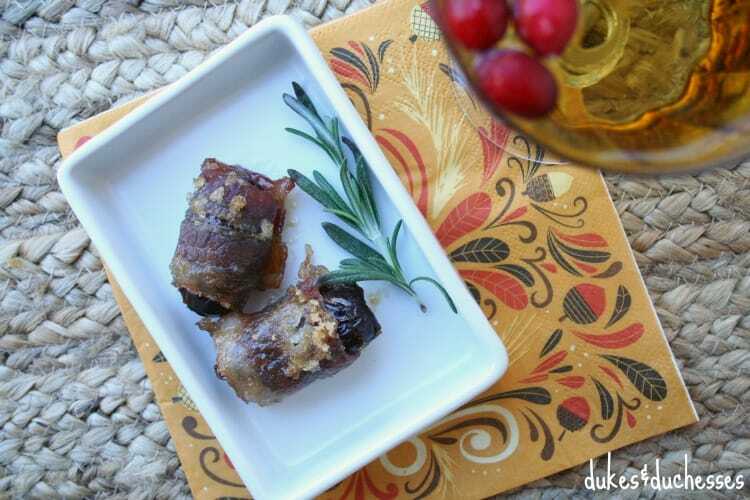 Hop over and check out these tasty Bacon Wrapped Dates from Randi over at Dukes and Duchesses. Yumm!! Looks delish!! 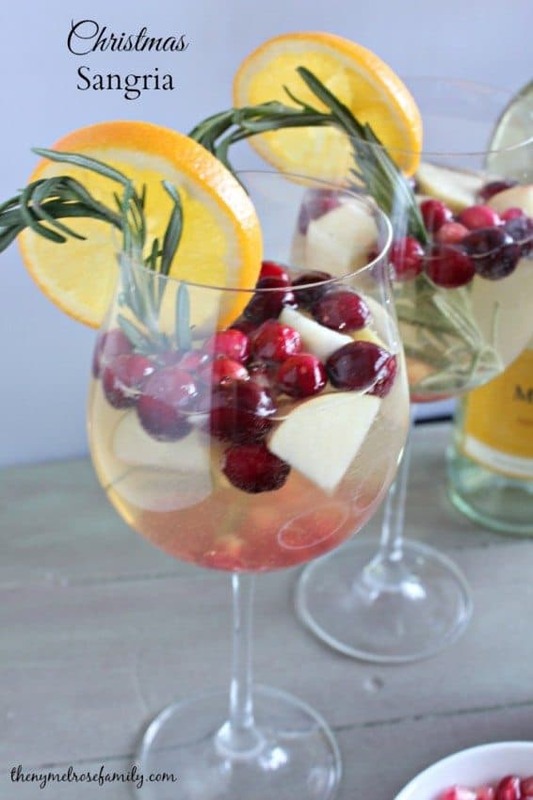 I love the combination of pomegranate and orange in a holiday sangria! Pinning!